A man, who robbed a dozen banks in the Chicagoland region between May 16 and August 31, and dubbed “The No Boundaries Bandit” because of his wide target area, was arrested Sunday, Aug. 31st by Cicero Police. 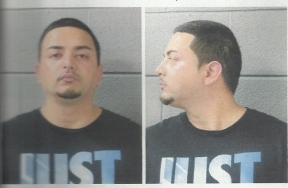 Cicero police immediately identified the suspect after viewing his images and recognized him as an individual who they had long suspected of involvement with local street gangs. Medillin is wanted in connection with at least 12 bank robberies between May and August, including five in Chicago and seven in the suburbs. His latest alleged robbery of a bank was the TCF Bank at 800 N. Harlem Avenue in River Forrest. Medellin was charged with multiple counts of armed robbery. They include: Felony Aggravated Assault to a Police Officer; Felony Aggravated Fleeing & Eluding Police; Felony Aggravated Unlawful Use of a Weapon by a Felon; multiple traffic violations; Parole Violation Warrant.